Mike and I will be married 7 years tomorrow, 1/31/11. As I’ve mentioned, we have signed up for Angie’s Half Crazy 1/2 Marathon on March 27th. Mike decided he wanted to try to run a 1/2 marathon today to see if he could do it. Yep…you heard that right. He doesn’t believe in “training” for a race, so he wanted to do a dry run first. In all fairness, he runs 4 miles every morning Monday-Friday so he’s in pretty good shape. We decided to call this the 7 Year Itch 1/2 Marathon since it’s right before the big day! Thankfully, neither one of us have the “itch”. Before I started I put Body Glide all over my feet since I typically get blisters pretty bad. Today I was scheduled to go 7 miles for my 1/2 marathon training. Originally, I was going to stop at 7 miles (since Mike is about twice s fast as me, that would put us finishing about the same time) however, I decided if he was going to do it, I was going to do it. I did the wogging thing again instead of interval running/walking. I went about a mile for each wogging time so I was happy with that. At some point I got tired and was walking faster than I was jogging so I stuck with just walking the rest. The first 8 miles weren’t too bad. I could feel a blister forming on the ball of both feet but it didn’t seem too bad. Mike passed me a few times on our track…no surprise there! Once I hit the 8 mile mark, I started going downhill quickly. I met back up with Mike (who finished his run in about 2:20 and actually probably ran closer to 15 miles since he goofed up one of his loops) about that time and he walked the rest of it with me. That was a big help. At this point, I was tired and wishing I had some music. I didn’t bring my nano because it was threatening to rain and I didn’t want to mess it up. I was hurting pretty good for the last 4 miles. The blisters were screaming and my legs were starting to really get tired. While I tried to increase my pace, I wasn’t successful. 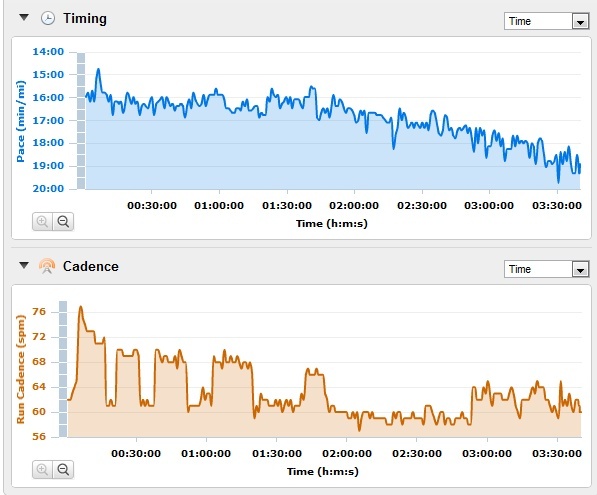 In fact, the difference between my starting pace and my ending pace is outrageous. Needless to say, I’m glad I have 2 more months to continue training for the next one. 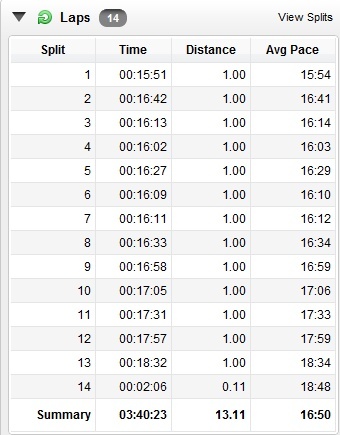 As you can see from my splits, I started struggling at mile 9 and just went downhill from there. My average was ok, not great. However, my doctor told me I’d probably only be able to do 3-5 miles when exercising because of my Tracheal Stenosis so I’m thrilled to prove him wrong! I am able to do most everything I want, and that means a lot to me. So…let’s see how this breaks down with the charts! See what I mean? I crashed and burned from mile 1 to mile 13! Oh well…this is a preliminary run so we’ll see what happens at the 1/2 marathon at the end of March! This entry was posted in Workout and tagged Race Training, Soreness, tracheal stenosis on January 30, 2011 by Tammy. I said it at DailyMile but I need to say it again here–I’m SO proud of your accomplishments! And you look amazing! I sure took a wrong turn. And I’m kicking myself for not following my own advice. I lost track of the bigger picture because I was too focused on doing a 1/2 marathon with no walking. I spent the last 6 months beating myself up for failing before I even tried. Ugh. Anyway, thank you for inspiring me today! Hey Danie! Thank you so much for your kind words, it’s always motivating to hear from others! I know what you mean about beating yourself up over something you hadn’t even done yet. It’s a mental issue I’ve had to deal with many times. I finally just had to accept the fact that I’m not a runner, as much as I may want to be, I’m just not there right now. Since I’ve done that, I’ve felt much better about my workouts.